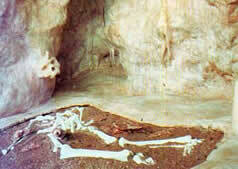 The cave and the anthropological museum of Petralona in Chalkidiki are a major tourist destination in Chalkidiki. The cave was discovered in the late 50s by locals. Some time later, the famous almost 700,000 years old, skull of the Archanthropus, a ancestral form of modern-day man, was discovered. It and was a scientific sensation and made the cave famous throughout the world. In the museum, which is very near to the cave, visitors can admire a collection of everyday tools of the Palaeolithic Age, and bones of lions, hyenas, deer and other animals. The central exhibit is the reconstruction of the area where the skull and bones of the Archantropus were discovered. Open: daily 09:00 to dusk.